Going from a conventional water heater to a Tankless Water Heater in Phoenix, AZ means that you're going to be saving some money on your power expenses. It also means, though, that you are likely to have to install the new system in a different place in your home (the tankless system needs more room to draw in air). If you pay attention before the installation, you can avoid a lot of headaches that can require some costly retrofitting and make a big mess in your home. Be sure that your venting material is consistent with local building codes and manufacturer's specifications. In most cases, you need a stainless steel vent for your Tankless Water Heater in Phoenix, AZ. It should also have seals inside it to keep carbon monoxide from getting out and harming you and your family. In some cases, you may have to have double-walled exhaust systems, depending on the code and the design. This is an expensive difference, and some contractors or plumbers may overlook this issue, either in manufacturer's instructions or in the building code. Make sure that you find out before you get started. Some models come with PVC exhaust because of the lower heat from their exhaust, but if your building code requires stainless steel, you have to use the metal anyway. Take care when planning the location for your Tankless Water Heater in Phoenix, AZ. If your water heater is gas-fired, it needs oxygen to achieve combustion. You don't want to back-draft the air through the exhaust pipe from another appliance, so you'll want to insist on a sealed-combustion direct-vent model. If you vent your exhaust through the wall, the outlet has to be a minimum of three feet from any window that you plan to open. Is your vent going up through the roof? You may be in trouble if you put the heater down in the cellar of a three-story house. The applicable length depends on the BTU output of the heater and the number of turns that the vent requires (or elbows). Keep these thoughts in mind when you're planning your appliance installation. 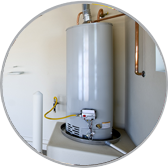 Tank water heater systems can be a real boon, but they also require a lot of planning before they go in.